If you need help with VitalBrowserHelper removal, then you have come to the right place. This article here deals with this adware program and how to get rid of it. You can skip reading the entire thing if you want to just remove the application right now. The guidelines for manual removal are provided below this article. However, you should also know where VitalBrowserHelper comes from and how it would be possible to avoid installing this adware program on your PC. After all, prevention is a very important part of the overall battle against potential computer security threats. Users download freeware apps on a regular basis. Most of the time, they get these programs from third-party file sharing websites. Unfortunately, quite often these freeware apps are packaged in one installer with additional programs that no one needs or wants. For instance, VitalBrowserHelper might be one of such applications, and if you do not check every single step in the installation wizard, you may accidentally allow the app to enter your system. Needless to say, VitalBrowserHelper is not a malicious infection that will destroy your system and steal your money. However, it is not an application you should tolerate because, as an adware program, VitalBrowserHelper may inadvertently expose you to a variety of potential computer security threats. However, we have to keep in mind that that the application does not review the ad content. In other words, it outsources the ad content to third-party advertising networks, and no one knows what kinds of links will be embedded in the VitalBrowserHelper ads. Thus, when you click an ad delivered by this application, you click it on your own risk. It is true that this application does not try to infect you with malware or anything, but it also does not exercise any kind of authority over the third-party security. Thus, you need to take your system’s safety into your own hands right now. Uninstall VitalBrowserHelper immediately via Control Panel. When you are done with the manual removal, scan your PC with a computer security tool of your choice to locate other potential threats and terminate them automatically. Do all you can to avoid similar issues in the future. Right-click the Windows icon on the taskbar. Go to Uninstall a program and remove VitalBrowserHelper. Select Uninstall a program and remove VitalBrowserHelper. 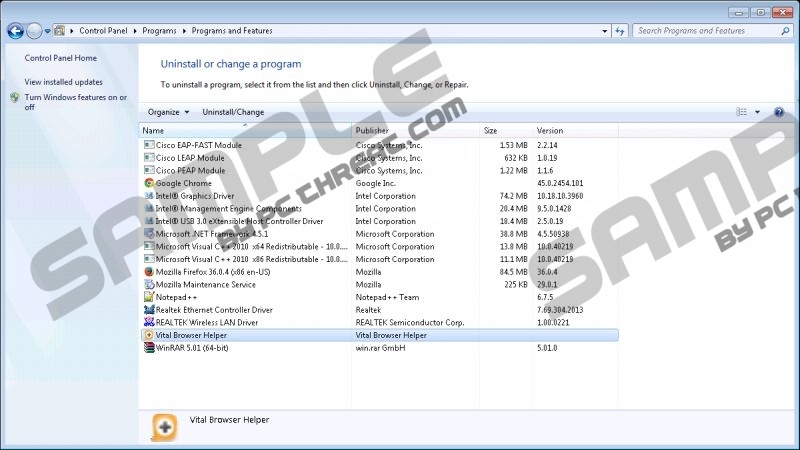 Access Add or remove programs and uninstall VitalBrowserHelper. Quick & tested solution for VitalBrowserHelper removal.